The BigHand for Healthcare system is a customised digital dictation, speech recognition and clinical correspondence solution designed by the NHS for the NHS to replaces tape and paper based systems used in medical dictation, transcription and transmission. Clinicians, Medical Secretaries and Service Level Managers are provided with an intuitive, easy to use interface enabling them to easily create, track, transcribe and manage workloads, as well as allowing them to leverage additional options such as Speech Recognition, Outsourcing or smartphone-based dictation. 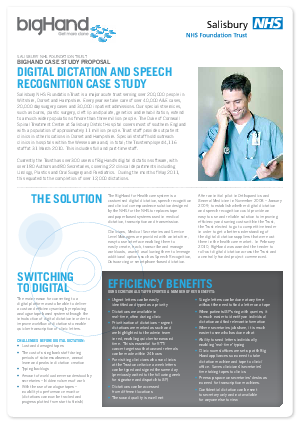 After an initial pilot in Orthopaedics and General Medicine in November 2008 – January 2009, to establish whether digital dictation and speech recognition could provide an easy to use and reliable solution to improving efficiency and saving costs within the Trust, the Trust elected to go to competitive tender in order to get a better understanding of the digital dictation suppliers that were out there in the healthcare market. In February 2010, BigHand was awarded the tender to roll-out digital dictation across the Trust and a centrally funded project commenced.